Paying your utility bills, PayTV, Data and airtime bills has never been easier. Using Easypay, we provide a straight forward interface to make the transaction as smooth and simple as possible. Merchant Accounts can earn commission from every bill paid. Consumers also receive cashbacks/commissions during promotional periods. Easypay also allows for people living abroad to pay their bills back in Uganda. To get started tap the bills icon in the home screen to reveal a right panel containing all your bills. Yaka! is the prepayment system from Umeme that allows customers to conveniently manage and control their electricity. 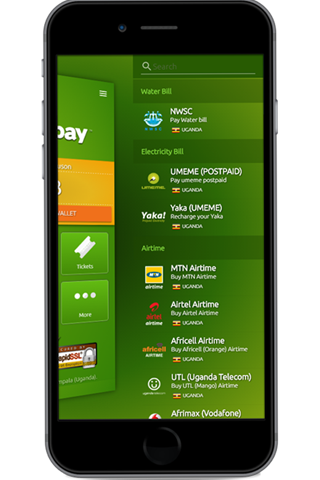 To learn more, How To PAY UMEME (Yaka) online using Easypay Mobile Wallet? With Umeme Postpaid accounts, the consumer is sent his/her bill at the end of the month. To learn more, How To PAY UMEME (Postpaid) online using Easypay Mobile Wallet? Pay your NWSC (water bills) online securely using Easypay Mobile Wallet. To learn more, How To Pay Water Bills in Uganda online using Easypay Mobile Wallet? Topup your MTN Uganda airtime using Easypay. To learn more, How To Topup MTN Airtime in Uganda online using Easypay Mobile Wallet? Topup your Airtel Uganda airtime using Easypay. To learn more, How To Topup Airtel Airtime in Uganda online using Easypay Mobile Wallet? Topup your Africell/Orange Uganda airtime using Easypay. To learn more, How To Topup Africell/Orange Airtime in Uganda online using Easypay Mobile Wallet? Topup your UTL – Uganda Telecom airtime using Easypay. To learn more, How To Topup UTL in Uganda online using Easypay Mobile Wallet? Topup your Afrimax/Vodafone airtime using Easypay. To learn more, How To Topup Afrimax/Vodafone in Uganda online using Easypay Mobile Wallet? Topup your Smile airtime using Easypay. To learn more, How To Topup Smile in Uganda online using Easypay Mobile Wallet? Topup your Smart airtime using Easypay. To learn more, How To Topup Smart in Uganda online using Easypay Mobile Wallet? Topup your LycaMobile airtime using Easypay. To learn more, How To Topup LycaMobile in Uganda online using Easypay Mobile Wallet? DSTV subscribers in Uganda need not worry about conveniently renewing their subscription thanks to Easypay. To learn more, How To renew DSTV package in Uganda online using Easypay Mobile Wallet? GOTV subscribers in Uganda can renew their subscription easily. To learn more, How To renew GOTV package in Uganda online using Easypay Mobile Wallet? Startimes subscribers in Uganda need not worry about conveniently renewing their subscription. To learn more, How To renew Startimes package in Uganda online using Easypay Mobile Wallet? ZUKU subscribers in Uganda can renew their subscription in just a few taps. To learn more, How To renew ZUKU package in Uganda online using Easypay Mobile Wallet? Topup your Smile Uganda internet bundle using Easypay. To learn more, How To Topup Smile Data/Internet Bundle in Uganda online using Easypay Mobile Wallet? Topup your Africell/Orange Uganda internet bundle using Easypay. To learn more, How To Topup Africell/Orange Data/Internet Bundle in Uganda online using Easypay Mobile Wallet? How To Topup Smile in Uganda online using Easypay Mobile Wallet?